I can't believe Raine is 2 years old, boy time does fly by. I also cannot believe this is my last cake this month!!!! I am a little sad about this but only a little. But after 3 kiddos and my mother's b-day all in June, my hands do need a break. 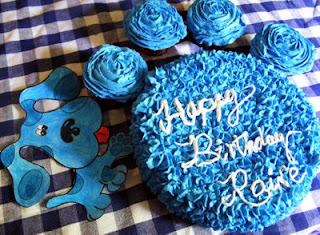 Raine is all about Blue's Clues so I did a "Clue" cake for her. There is a little Tasty Freeze of sorts in a nearby town and they have paw prints all over their building. Each time we drive by it we must stop because Raine is yelling, "a clue, a clue." This is What's Cookin on Beaty's Creek today. TOO CUTE! Oh, and don't be sad - you can make me a cake ANY time you want to, LOL!